iGEM TU Eindhoven created this scaffold protein by computational design and checked its functioning and orthogonality using the NanoBiT reporter system. 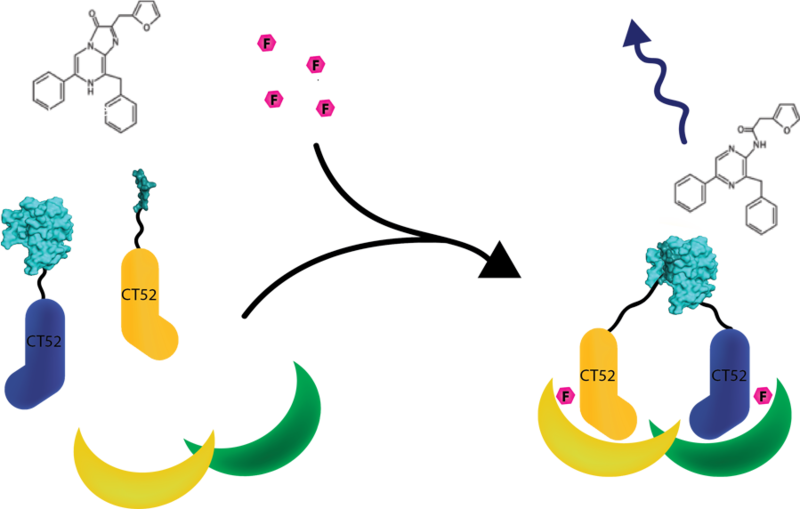 This system was linked to CT52 (CT52-SmallBiT"http://parts.igem.org/Part:BBa_K2065000" and CT52-LargeBiT"http://parts.igem.org/Part:BBa_K2065007") These two proteins could dimerize on our heterodimeric T-14-3-3 scaffold proteins with mutation which were designed by our team. When dimerized the functional luciferase protein was formed. This protein showed luminescence at 460 nm. Thus this system was used as a read out method for T14-3-3 heterodimers. This system is schematically visualised in figure 1. For more detailed information about the application of CT52-SmallBiT visit our wiki for all results of this heterodimer. "http://2016.igem.org/Team:TU-Eindhoven/Results"